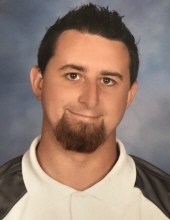 Aaron Michael Kemp passed away on February 3, 2019 in Sun City West, Arizona. Aaron was a loving and devoted husband, father, brother, son, uncle and best friend. He cherished the time spent with his wife and children making memories; especially Sundays which were set aside as “Family Day”. More than anything, Aaron loved to make people happy and he always knew how to make everyone smile and laugh, no matter what the circumstance was. Aaron’s passion in life was working on cars, which he has done since a young age. Being able to help someone else with their cars, brought him pure joy. His spirit of giving continued on with his last gift of organ & tissue donation; which will touch the lives of almost 40 people. Aaron is survived by his wife of 7 years, Jennifer Kemp, children Emma Kemp (6) and Evan Kemp (3), mother Kimberly Kemp, sister Rachel Kemp (Bradley Hovlid), nephew Oliver Hovlid and best friends Kris King and Dennis Russom. He is preceded in death by his father Mike Kemp, Grandma Lou, Grandma Betty, uncle Mitch Reynolds, cousin Alex Holbrook and his dog/loving companion Blue Kemp. To send flowers or a remembrance gift to the family of Aaron Michael Kemp, please visit our Tribute Store. "Email Address" would like to share the life celebration of Aaron Michael Kemp. Click on the "link" to go to share a favorite memory or leave a condolence message for the family.